Pennington, NJ / February 15, 2019 / CentralJersey.com — Forget the heart-shaped candy and the pretty pink Valentine’s Day cards. For Gabe and Nora Popper, who are closing in on 60 years of marriage, every day is Valentine’s Day. “We love each other every day of the year as much as we do on Valentine’s Day. 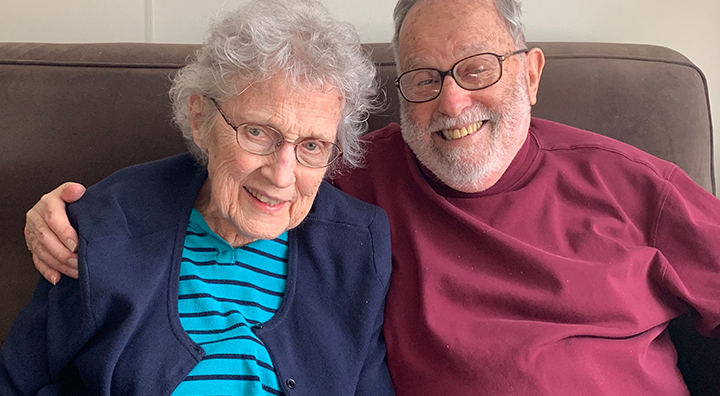 I think we love each other as much now as we did then,” Mrs. Popper said, seated in a chair in the library at the Brandywine Living at Pennington assisted living facility. The couple, who raised their family in Edison, moved to Brandywine Living at Pennington a few months ago. They wanted to be closer to their daughter, Dr. Judy Williamson, who is a physician at Capital Health Medical Center – Hopewell, and who lives in Pennington. The Poppers, who are both 86 years old, met on what they agreed was “a kind of, sort of” blind date in 1958. It was February, and Mrs. Popper was visiting her former college roommate, who at the time was dating Mr. Popper. While Mrs. Popper was visiting her former college roommate, a man that her former college roommate had been dating – in addition to Mr. Popper – had called for a date. As a favor, she asked Mrs. Popper to go out with Mr. Popper so she could accept the other date. “She asked me to go out with Gabe. Little did I suspect that anything would come out of it,” Mrs. Popper said, as she glanced over at her husband, who was sitting across from her on a sofa. “We went out by ourselves to a bar. We sat in the bar for three or four hours, just talking. We talked about the merits of growing up in a small town. I grew up in Williamsport, Pa., which is noted for being the home of Little League baseball,” Mrs. Popper said. Mr. Popper, whose family emigrated from Hungary to the United States when he was 9 years old, grew up in Ridgewood and Glen Rock, in northern New Jersey. Mr. Popper, who was living in Collingswood, called her and they stayed in touch. Mr. Popper knew soon after they met that he wanted to marry her. “I saw Gabe a few times, and the next thing I knew, he invited his family to meet me. They were lovely people, but it made me extremely nervous. I wasn’t ready (to commit to a relationship). I thought the man I would marry would come whisk me away on a white steed,” she said with a smile. Instead, their relationship grew slowly but ever so surely. They discovered that they had many common interests. They shared a love of art, classical music and opera – although their taste in opera differs. Mr. Popper’s favorite opera is “La Boheme,” by Giacomo Puccini, and Mrs. Popper’s favorite is “Don Giovanni,” by Wolfgang Amadeus Mozart. “I thought about Gabe the whole time. I was 27 years old. I don’t know what I was waiting for. I felt somebody would tell me, ‘This is the right person to marry,’ but they didn’t,” she said. “Love is so ethereal, so esoteric. I realized we had a lot in common. It took me six months – until December – to realize it. We had a good relationship,” Mrs. Popper said, adding that it has grown into a “comfortable” relationship after six decades. “It wasn’t exactly a romantic proposal, but I knew exactly what he meant – a wedding date. The rest is history,” Mrs. Popper said. The proposal grew out of what was beginning to become a tiresome routine of taking Mrs. Popper to the 30th St. train station in Philadelphia at the end of the weekend so she could go home to Harrisburg. “The day we got married, at the end (of the wedding), I said to my father, ‘My social life has been taken care of.’ He burst into tears (of happiness),” Mr. Popper recalled. The Poppers acknowledged that life was not a bowl of cherries. One of the most challenging issues that they faced was figuring out how to pay for college tuition for their five children, all of whom were born in quick succession. The gap between the oldest child and the youngest child is five-and-a-half years. “We just went through it, day by day,” Mr. Popper said. “Gabe was very adaptable, and that’s one of the things that I loved about him. If we had a problem, we worked it out together,” Mrs. Popper said. The couple also agreed that what has kept them together for nearly 60 years of marriage is their common interests. They learned to love to travel after their children were grow, planning out where they wanted to go next, Mr. Popper said. And as for Valentine’s Day – “I think it’s just another day, a continuation of our years together. Valentine’s Day doesn’t stand out, except the children shamed me into buying something for Nora,” Mr. Popper said with a small smile. “Every day is Valentine’s Day,” his wife agreed.